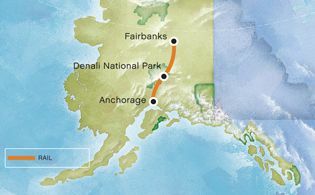 Experience the Alaska Railroad route from Denali National Park to Talkeetna in one of our premium, glass-domed railcars. Opt for a meal and your favorite beverage while aboard and enjoy the expert commentary of your Rail Guide. Click here to view the rail schedule and please remember to arrive at the depot 30 minutes prior to departure. This Rail-Only option includes rail transportation only. This does not include hotel accommodations or transfers (transportation) to/from the depot and does not include transfers (transportation) to/from hotels in Denali.